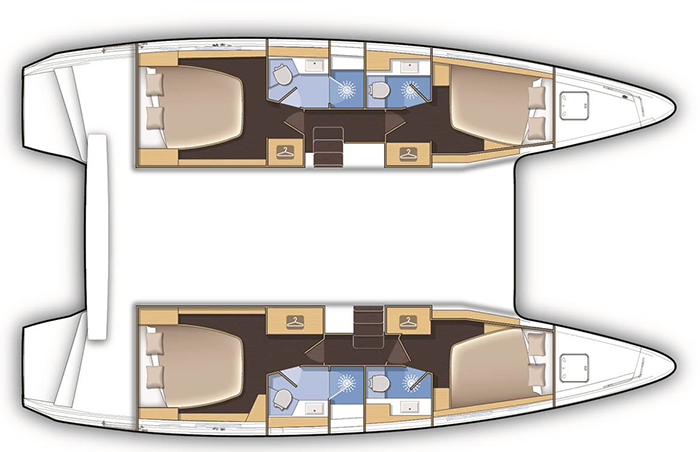 The Lagoon 42 available for charter from Road Town in Tortola in the British Virgin Islands is the new generation of catamarans that will allow you to sail in the beautiful islands like Virgin Gorda, Anegada, Jost Van Dyke or Prickly Pear and Eustatia. Chartered from Virgin Islands, this catamaran has 4 double cabins with bathroom and able to accommodate up to 8 passengers. Additionally, she has a beautiful kitchen, all embedded electronics and a CD / MP3 player. This area of ​​the Caribbean Sea will allow you to cruise around islands with white sand beaches like Norman Island, Cooper Island, Ginger Island, Salt Island, Saba Rock or Sandy Cay and their turquoise waters. For those looking for a great and beautiful navigation, you can very well imagine starting your Lagoon 42 catamaran charter from Saint Martin to the British Virgin Islands. Customer Advice: The presence of a professional skipper is not mandatory on board, however you will be asked to provide a strong sailing resume. This catamaran is available for yacht charter with a base price of 5 950 $ (approximatly 5 276 €).